I2C or ISP protocol, what chice? Both options are okay, ISP protocol is faster, can run over 40 MHz, but sometimes we have more than one device, so it is better sometimes to use I2C protocol. After all, ADC conversion on this device may take up to 10 mS, so faster protocol will not yield faster reading. 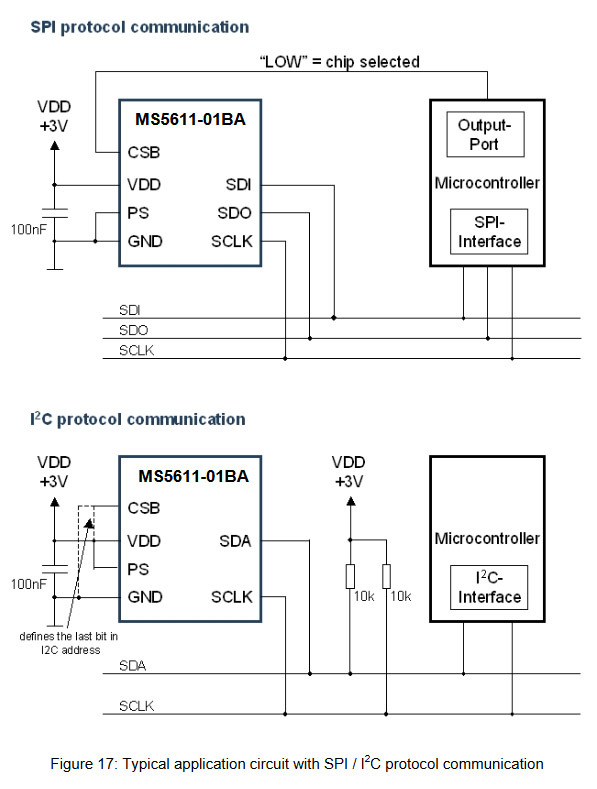 First we need to look at schematic diagram to know how to connect MS5611 to STM32 board(s). In our case of I2C interfacing, we should look at second part of the picture below. (I included whole datasheet even more below. Note that in the case of I2C, pin CSB play different role than in ISP mode. Leave it unconnected for address 0x77, or connect to Vdd in the case you already have the same device, this time address will be 0x76. 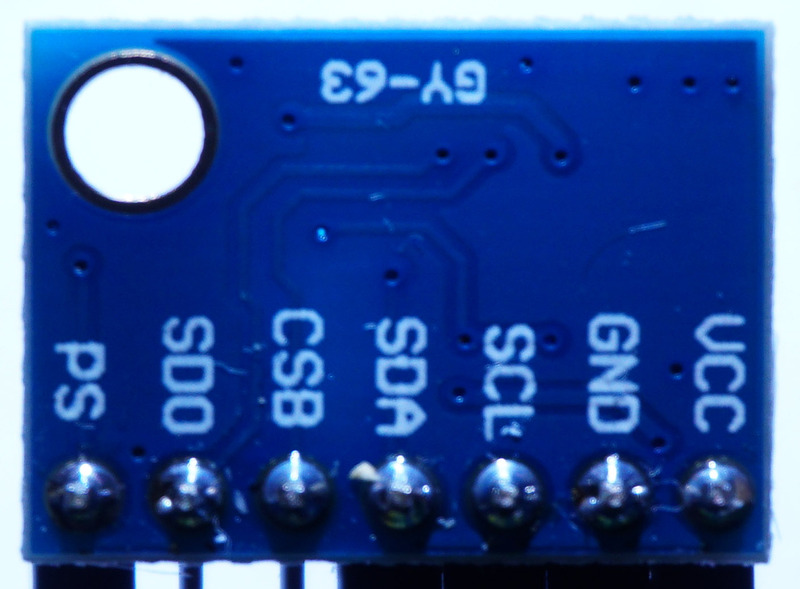 For STM32f10x family, SDA pin is connected to GPIO B7 and SCL to GPIO B6. As this page is intended for learning I2C protocol on STM32 micro-controllers, I will talk here only about this protocol. SPI will come later, and if you are subscribed to the website, you will get e-mail notification about updates. Back to connections – pin PS on MS5611 must be on Vdd, since it is Protocol Select. In the document it says that it is low voltage device, and 3V is mentioned, but absolute maximum rating is 4V, so if STM32 works on 3.3V, that is exactly what we want. On the board GY-63, it is confusing where is SDI for SPI protocol. It is the same pin as SDA, but someone forget to add that pin name “SDA/SDI”. In both cases SDI/SDA gives us data, while SCL or SCLK as is on datasheet has clock. We here need for I2C SDA and SCL only for communication. Vcc (or Vdd in the document) goes to +3.3V, GND to GND of STM32, and PS to Vdd bypass or separate wire to available +3.3V on the STM32 board. For complete work in Keil, we need 7 files, all seven should be in the same directory of the project with name, for example MS5611 barometer. It has thermometer too with two digits decimal precision. Your choice of project name, but name of individual component must be as is the name of .c and .h files, since it depends of ‘#include’ statements. Here I will give you all 7 files, of which first is barometer.c (containing main() function), wire.c, wire.h, delayUs.c, delayUs.h, printMsg.c, printMsg.h . All MCU programming is done using ST-link dongle. For data transfer to the computer, you need FTDI usb dongle. if (TEMP<2000) //if temperature of the sensor goes below 20°C, it activates "second order temperature compensation"
//In new (2019/03/01) added twiScan(); function. You may use it to find your I2C device. Just remove // coment characters. External link for STM32f10x series.